You may have seen our exciting new CAL with Paintbox Yarns, the Crochet Girl Gang CAL. Emma, from crochet blog Potter & Bloom, introduces us to the Crochet Girl Gang community. The #crochetgirlgang is an online (mainly Instagram) community of like-minded crochet addicts. 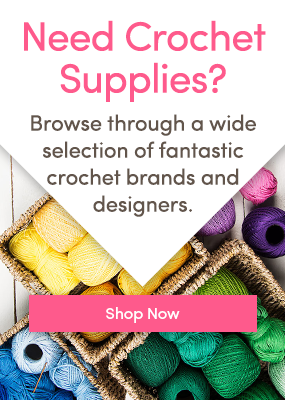 If you browse the hashtag, you will see that it is full of wonderful crochet makers, sellers, designers and yarn obsessed girls who just want to have fun, make stuff and be nice to one another. I created the #crochetgirlgang hashtag in March this year as a way to promote positivity, solidarity and respect in the rapidly growing online crochet community. I felt lucky to have a strong gang of supportive women cheering me on as I grew my crochet career, especially because sometimes social media, in particular Instagram, can leave you feeling a little bit isolated and vulnerable. It’s nice to know that there are people out there who will make you feel good about what you do and appreciate the hard work that goes into every creation. Sometimes just one person saying they love your picture can make all the difference to your day, especially if you’ve been having a bad one. I wanted everyone to feel like that, to create an inclusive community where all the gang feels supported by their peers and even people who are new to crochet or new to Instagram can get their creations shared and applauded. You don’t have to join the gang, there is no elaborate initiation ceremony, you don’t have to have a certain number of followers, nor is anyone excluded. All it takes to be in the gang is to use the hashtag whenever you post a crochet picture, enjoy looking at other people’s gorgeous crochet creations and maybe leave a positive, happy comment from time to time. Join the Crochet Girl Gang CAL today and get your pack here. Emma Potter Emma is a home-loving, colour obsessed crochet designer. With a passion for the humble and incredibly awesome granny square and a dedication to bringing back 1970's crochet designs to the world, Emma believes that everyone should wear a colourful crocheted poncho at least once in their life. 3 Responses to What is the #CrochetGirlGang? Please can I join your gang, i love crocheting, but want to learn more.